The Catholic Church has distanced itself from the Spiritual Director of the Adoration Ministry, Enugu, Rev. Fr. Ejike Mbaka, over his perceived politically charged statements ahead of 2019. 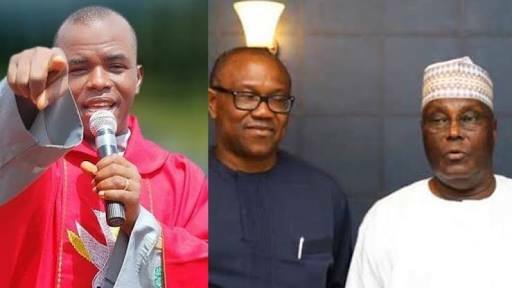 The outspoken priest had told PDP vice presidential candidate, Peter Obi, during a church event that that he and Atiku Abubakar's presidential bid would end in shame, if they continued on the same trajectory. 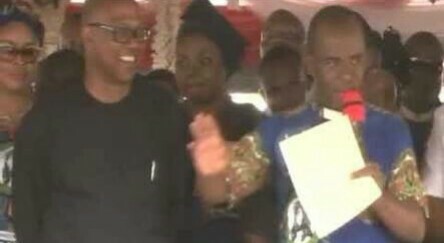 Mbaka, speaking to Peter Obi during the annual harvest and bazaar celebration of the church on Sunday, said, “(Former) governor, listen, so that we won’t be deceiving God. As you are standing in the presence of these children of God, tell God what you will do for Him... It means you don’t want to do anything for God. While speaking with The Punch, the Director of Communications, Catholic Diocese of Enugu, Rev. Fr. Benjamin Achi, in a reaction to Mbaka's comments, distanced the Catholic Church from the cleric's politically charged statements. Achi who disclosed that the diocese was not in support of Mbaka's remarks, noted that it was wrong for priests to make political statements from the pulpit. When asked if Mbaka was still a member of the diocese, Achi said,“He is”, adding that “The diocese is not in support of any priest making political statements. “The church is supposed to be apolitical and the Bishops’ conference has said that repeatedly. We are not supposed to make any political statements from the pulpit within the context of Mass, that is, church service.